October 25, 2018. 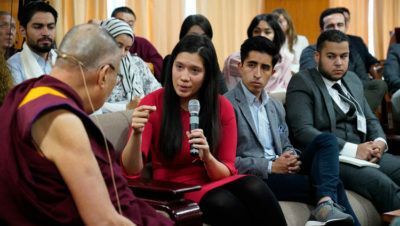 Thekchen Chöling, Dharamsala, HP, India – For the third year in a row the United States Institute of Peace (USIP) has brought a group of youth leaders from conflict zones to meet His Holiness the Dalai Lama. USIP is a nonpartisan and independent institution tasked with promoting national security and global stability by reducing violent conflicts abroad. Led by USIP President Nancy Lindborg, the 27 youth leaders, and three who came last year but who are now assisting as trainers, came from 12 different countries: Afghanistan, Burma, the Central African Republic, Colombia, Iraq, Libya, Nigeria, Somalia, South Sudan, Syria, Tunisia and Venezuela. When His Holiness entered the room today he bid them all, “Good morning,” and shook hands with members of the morning’s first panel. Nancy Lindborg guided the conversation by calling on youth leaders to introduce themselves and put their questions to His Holiness. The first, posed by a delegate from Venezuela, was about whether it is possible to achieve peace when you have no freedom. 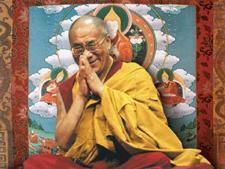 “There are different levels of peace,” His Holiness told her, describing his own experience of life in a conflict zone. “When Chinese Communists first invaded Tibet their control of the country was not so tight. In 1954 I went to Beijing to attend the People’s Congress. I met Chairman Mao several times. He didn’t conduct himself like a political leader. He behaved like an old farmer who’d become a revolutionary. I developed some respect for him and the other party leaders I met. We discussed the history of the revolution and Marx’s ideas. I was attracted then as now to his socio-economic theories, especially the notion of equal distribution. “However, during the Bolshevik Revolution, Lenin spoiled things with his war-time mentality and the perpetuation of secrecy, suspicion and suppression. These attitudes led directly to totalitarianism. Eventually Stalin made things worse. Nevertheless, I found that in the early years, Chinese revolutionary leaders were really dedicated, but once they tasted power it seems exercising it became more important than ideology. This is what produced the Cultural Revolution. Good, straightforward, honest people were dismissed, while cunning individuals like Zhou Enlai survived. “As I returned home in 1955 I met General Zhang Guohua on the way and told him that when I set out the previous year I had been apprehensive, but I was returning full of confidence. Yet from 1956 onwards it seems the Chinese officials grew more suspicious of me. At the same time, reform was ruthlessly imposed, starting in Eastern Tibet, which caused the people to revolt. However, the former servants of Tibetan feudal landlords showed them kindness by letting them know when they were about to be subjected to class-struggle sessions enabling some of them to escape to India. His Holiness went on to explain how in exile the focus had been on preserving Tibetan culture and identity by educating Tibetan children. He called this a realistic approach mentioning that resorting to anger and violence is self-destructive and leads to harsher suppression. He stressed that violence is the wrong method to bring about change. Nancy Lindborg added that USIP has evidence to that non-violence is consistently more effective in the long run. His Holiness noted that there are now estimated to be 400 million Buddhists in China, many of whom appreciate the value of Tibetan Buddhism. He remarked that while the Chinese could bring material development and physical comfort to Tibet, Tibetans can offer China spiritual development and peace of mind. The key, he said, is to remain determined, to be realistic and to take action. Responding to a question about the role of women, His Holiness observed that women have been shown to be more sensitive to others’ suffering. Conversely, heroes celebrated for killing their opponents are almost always men. In a Buddhist context, he said, we refer to other beings as ‘all mother sentient beings’ in acknowledgment of their kindness. He reiterated advice he often gives about the need to see more women in leadership roles and more closely involved in education about compassion. He quoted former President of Ireland and human rights campaigner, Mary Robinson, as referring to him as a ‘feminist Dalai Lama’. His Holiness confirmed the importance of using technology wherever possible to overcome a lack of knowledge. He recalled that in Tibet the primary source of news from the outside world was the Muslim traders who travelled to and from India. He observed that people in more isolated countries are more likely to think in terms of one truth, one religion. This approach is fine on a personal level, he said, but the reality of the world we live in is that there are several major religions and truth can have many aspects. Noting that many problems we face arise from a basic lack of moral principles, His Holiness recommended training the mind, cultivating a deeper concern for the well-being of others. Such concern arises naturally when we regard other people as brothers and sisters. “We have to remember that each and every one of us is a part of humanity. We need to be determined to achieve positive change, but also need to be able to take a long view of what needs to be done. What is important is not to become demoralized. Optimism leads to success; pessimism leads to defeat. One person can be the source of inspiration for many others. Those of us who practise Buddhism aim to achieve Buddhahood, which is almost impossible for most of us, but the very aspiration gives us inner strength. A youth leader from South Sudan who came to Dharamsala last year and who has returned this year as a trainer gave a brief appraisal of the two meetings she had attended with His Holiness. “Ideas may travel from the top down, but the movements that will put them into effect have to work from the bottom up. I am very encouraged to see how young people like you are trying to bring about positive change. We have good grounds to be confident because our efforts are based on truth and reason—therefore we will succeed. Nancy Lindborg expressed thanks to everyone who had contributed to making the meetings fruitful including the staff of His Holiness’s Office, of USIP and Radio Free Asia. She offered His Holiness a USIP peace cap, which he put on with a smile. His parting advice was that this kind of meeting comes about as a result of the co-operation of individuals.